Improv can help get the best ideas out of your team by helping them embrace mutual support, collaborative thinking, and the power of saying "yes." How much is a good idea worth to your clients and your company? Every night improvisers create an entirely new and creative product, delivered to a critical audience. It’s innovation, produced on-the-spot, in a high-stakes environment. WIT@Work’s workshops can help your team learn the improv principles and skills necessary to bring this level of creativity and innovation to their work. There’s abundant research demonstrating that creativity is a skill (versus an inherent trait). And, like all skills, it gets better with training and practice. Our workshops will help your team discover their own creativity and learn how to build and harness that skill in their work. Improvisers learn that creativity takes a whole ensemble approach. Our workshops helps instill and rehearse the group values and habits that help creativity and innovation flourish. How much is a good idea worth to your company and to your clients? Innovation is a key driver of growth and survival for organizations, and applied improv is an engaging and effective tool to develop and foster it. 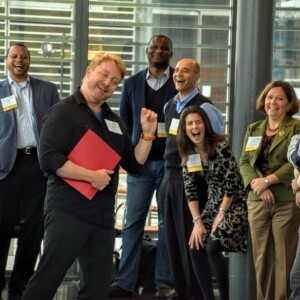 The same skills, norms, and process that helps improvisers create a new show, every time they step on stage before a critical audience, can be used to help your organization innovate and take creative leaps forward.WIT@Work helps organizations develop and promote improv in two ways: skills training and facilitation. Creativity and innovation are skills that can learned, improved, and rehearsed. 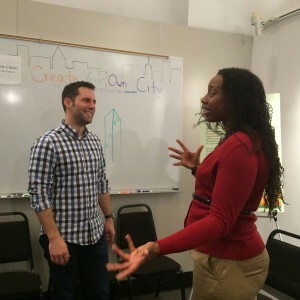 Our WIT@Work applied improv workshops help individuals and teams in organizations recognize and tap into their own creativity, and they teach groups new ways to collaborate and innovate effectively as a team. Creativity is critical, and there are more tools for effectively developing and fostering it than simply sitting in front of a flip chart and making “brainstorming” lists. In addition to workshops and skill training, WIT@Work offers group facilitation focused on ideation and innovation. From brief half-day ideation sessions to extended innovation retreats, WIT@Work can design and facilitate a process that helps your team generate and explore ideas that tackle the problems and opportunities you care most about. We’ve conducted WIT@Work workshops focused on creativity and innovation for clients across virtually every industry and public sector: advertising, marketing, PR, international development, technology, finance, security and intelligence, government innovation, and more. We also have designed and professionally facilitated meetings and retreats focused on innovation and collaboration among stakeholders in high-stakes projects. For example, we designed and led a mid-project retreat for a World Bank-funded ($35 million) Regional Disaster Vulnerability Reduction Project in Grenada, bringing together stakeholders across over a dozen government agencies and ministries. The Director of WIT@Work, John Windmueller, holds a Ph.D. in Conflict Analysis and Resolution and has over two decades of experiencing designing and facilitating meetings that help groups have constructive conversations and take creative leaps forward together. What's the average length of time for team building workshops? We will tailor the teambuilding workshop to fit your time constraints. Typically, teambuilding workshops last between 1.5 and 3 hours. How many participants can you accommodate? We have run workshops for groups ranging in size from five to five hundred participants. Can you conduct the training here at our site? Yes! We’re happy to travel to your site. All that’s needed is an open space large enough for the whole group (or multiple break-out groups) to stand in a large circle. Ideally there is also seating around the outer edge of the room. We’re also happy to travel outside the DC region and have led WIT@Work workshops across the US and internationally. Can you conduct the training at your theater? Yes! WIT@Work is based out of Source (1835 14th St. NW), and we can host the training in one of our classrooms or the theater space itself. If hosted at the theater, additional space rental charges will apply. Cost varies by length of time, number of participants, and site location. If you fill out this form (link to query) we can quickly get back to you with additional information and a price quote. We do our best to work with your training goals, time constraints, and budget. Curious about bringing some WIT to your workplace? Just fill out this questionnaire and submit it. Our WIT@Work Training Manager, John Windmueller, will be in touch with you shortly. Are you interested team building, developing communication skills, or sparking creativity and innovation? All of the above? Check off the focus area(s) that most interest you. If you’d like, share some some context about your group and the goals and challenges you want to address in the optional notes sections. When you’re ready, hit the submit button below. We’lll be in touch soon.